This rhetorical question, posed by Martin to his half brother Ivan, is indicative of the truth that lies at the heart of F, the latest novel by German/Austrian author Daniel Kehlmann. Learning to live with mediocrity is something all of the Friedland boys struggle with. Martin has found everything he requires in the priesthood – everything, that is, but faith. The Rubik’s Cube, that multi-coloured plastic puzzle that was all the rage in the 1980s, retains the soul of his devotion while God has remained absent. Ivan is a would be artist who doubts his own ability but will ultimately find artistic expression forging “masterpieces” in collaboration with an elderly lover who agrees to take the credit. His twin brother Eric channels his personal insecurity into a career in asset management, complete with trophy wife, daughter and mistresses, until his increased involvement in fraudulent financial transactions drive him to a state of paranoid psychosis. Faith, forgery, fraud. See a pattern? Don’t forget family. And, of course, father. As the book opens we see Arthur, a remarkably unambitious writer stagnating in his second marriage, as he takes his three young sons to see a performance by a hypnotist. Ivan and Arthur, both skeptics about the entire process, are invited to take turns on the stage. Their experiences that day could be said to set in motion the events that unwind and unspool as the boys grow up and try to find their footing as adults in the world. Or is there another, “F” word at play? Either way, Arthur disappears from the lives of his sons and their mothers on that very same day and none of them will hear from him for many years. Confused yet? This is not a straight forward narrative by any means. It is told in parallel intersecting threads, a sweeping backward genealogy and a glimpse into the possible prospects of the next generation of the Friedland clan – prospects which rest rather heavily on the shoulders of Eric’s daughter Marie. At times insightful, sometimes funny and at other times drawing in elements of the gothic ghost story, F: A Novel endeavours to wind a tale too slippery to be tied down. Ah but does it work? I was looking forward to this novel and, for pure entertainment I think it works quite well. The translation by Carol Brown Janeway is clean and precise. However, I am not convinced that it holds up to the critical reading expected of a potential prize winner. I found the characters too one dimensional and the coincidences just a little too neat and convenient for my tastes. International Foreign Fiction Prize 2015: There are four German authors on the IFFP longlist this year. Compared to the two I have read so far, I am less inclined to feel this one is shortlist quality, but of course, we shall see what the jury decides. Thank you. I am reading (or trying to read) all 15 long listed IFFP novels in a just a few weeks with a shadow jury so the competition is intense. I think I would enjoy this as a casual read but it did not grab or hold my attention as much as I expected. I would read his earlier work though, this was my first. I enjoyed reading your review. 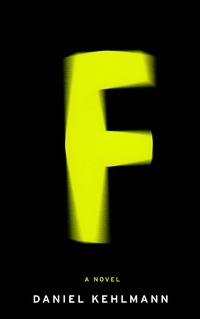 ‘F’ sounds intriguing, a little like a puzzle that you have to piece together (or try to!). I have heard it described as reading like a möbius strip. A pretty accurate description. I like the premise of the book. One of the characters is quite psychotic and paranoid. You would likely enjoy his internal monologue, I thought it was well presented. Ta, I’m going to check my pirate ship for it. I agree with you about wondering if it can hold a candle to the other German authors, so ecifically Jenny Erpenbeck. While there were parts I certainly enjoyed, namely Eric’s day of utter distraught frantically trying to appease everyone, I ended up not feeling terribly impressed overall. To me, it was just a novel of men without much integrity. I am glad you had the same impression. I’m just finishing While the Gods Were Sleeping by the Belgian author Erwin Mortier. It is extraordinarily powerful, very different in style, but for me personally will be up there with The End of Days. Makes F seem even more average by comparison. I’m finishing In The Beginning Was The Sea, then it’s While The Gods Were Sleeping. Can’t wait, after your comment! We seem to have very similar feelings about the books we’ve read so far. Well done! I wanted to like this book a lot but just couldn’t. Was it entertaining? Mostly, yes. But I agree that it definitely does not hold up to critical evaluation. Glad you agree. When reading so many books like this back to back, the merely entertaining don’t hold up against the more seriously literary works. I wonder how the use of ‘F’ words worked in the translation process? A Void by Perec comes to mind here. Hi Jeff. If anything I feel that there is an even looser range of interpretation possible with the translation in to English (which makes me cynically wonder how much he was writing with an eye to translation). I am not sure if another title would be chosen for translation into other languages in the way that translation of A Void caused translators to impose differing restrictions upon themselves. In my reading the “F” word aspect was convenient but secondary to the type of story he was trying to weave. If he did let it restrict him it was not to the improvement of the novel as a whole for me personally.